The brainchild of Wilfred Capper MBE who in 1946 had the inspiration to create a circular walking route through the six counties of Northern Ireland, the Ulster Way covers some of the best landscapes NI has to offer. Made up of a number of quality walking sections you don't have to complete the entire route in one go. In this upcoming series of blogs, we will be highlighting the key quality sections worth exploring in just 2 or 3 days. The 26-mile long Mourne Way is a marvellously varied, two-day walk from the coast at Newcastle across the edge of the Mourne Mountains, and back to the sea at the opposite side of the range. This route explores the foothills of the Mournes following following forest trails and mountain tracks, ensuring you experience the magnificent views without the major climbs. Following the Shimna River out of the bustling seaside town of Newcastle the route heads towards Tollymore Forest Park. Oak wood from this forest was the preferred material for the interiors of the mighty White Star shipping liners, including the ill-fated Titanic built in Belfast in 1911. From here you will soon reach the ‘Brandy Pad’ an old smuggler’s trail which leads to Fofanny Dam Reservoir the first of two important reservoirs in the area. With an underground water treatment works capable of processing 52 million litres of water a day. This days walking finishes not far from here at Ott car park. 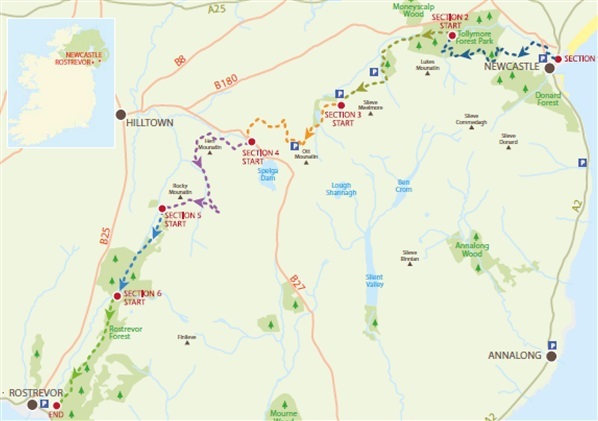 There are a wide range of walker friendly B&Bs, guesthouses, hotels and hostels in Newcastle and Rostrevor, at both ends of the Mourne Way. We recommend choosing one place to stay and availing of transport on each day of your walk. The popular Meelmore Lodge offers hostel accommodation, camping and a coffee shop approximately 7.5 miles (12km) along the route. More accommodation information can be found on pg. 17 of the Mourne Way Guide. After a hard days walking, some good food and drink is a must. A list of great suggestions can be found on pg. 20 of the Mourne Mountain Walkers Guide including Niki's Kitchen, Newcastle a great place to pick up a packed lunch to enjoy later on the hills and Kilbroney Bar, Rostrevor which promises great atmosphere and entertainment. There are a number of ways in which you can travel around the Mournes ideal for those who wish to base themselves in one location and avoid the hassle. Translink operate a dedicated Mourne Rambler bus service through the Mournes in the summer months only. Other bus services are available in the area and can be planned using the Translink Journey Planner. Mournes Shuttle Services (AIMSS) is a bespoke shuttle and support service available to walkers. For more information or to book, contact Peter Magowan on 075 16412076. A number of local taxi companies can pick up and drop off at the start and end of your walk each day. For contact details on all of the above please check out pg. 20 of the Mourne Mountains Walkers Guide. Please be aware that this walking route passes through areas of open land such as hillside, working farmland and working forests. Livestock may be present, ground conditions may be uneven or wet underfoot and all forestry signage should be adhered to. Please refer to the ‘Walk Safely and Responsibly’ Guide. Although this walk is waymarked walkers are always advised to carry the relevant map and ensure they are prepared for changeable weather. More information on this walk can be found for free in the downloadable Mourne Way Guide. The Sperrins Gateway located south-east of Co. Derry~Londonderry remains an undiscovered gem for many in Northern Ireland. Hosting spectacular scenery, untouched countryside, rolling hills and green fields walking here is sure to give you the scenic escape you're looking for. Boasting stunning scenery, this fully waymarked trail is well worth exploring. The trail which can be explored in either direction follows a mixture of winding country roads past the derelict clachan of Crockataggard and rural field track past several old but atmospheric farmstead ruins. Those in search of superb panoramic views will not be disappointed by this walk. Key features on this walk include a large glacial erratic composed of folded, contorted and very ancient schist rock. You will also pass extensive deposits of blanket bog and discover the hidden mountain lough of Lough Ouske on the northern slopes of Slievevaddy (Sliabh an mhadaidh- mountain of the dog). This trail will lead you through a conifer forest climbing up the slopes of Mullaghmore to the stunning rock face of Craig-na-shoke. Here you will be rewarded with extensive views over the surrounding hills and countryside with the summits of Benbradagh, Binevenagh and the Inishowen peninsula coming into view as you go higher. The short trail at Reuben’s Glen follows a beautiful ancient coach road that once linked the plantation towns of Draperstown and Moneymore in the early 17th Century. The last remaining identifiable part of what was once an important thoroughfare the trail will follows a small river through a mixed woodland. There are 3 trails to choose from within the enchanting grounds of Springhill owned by the National Trust. Explore the mixed woodland, walk through a wildflower meadow, stop at an enchanting tree door to see if anyone is home and uncover clearings full of natural play sure to capture the imaginations of children and adults alike. Beyond this you have the option to explore the perimeter of the estate or take a stroll along the spectacular avenue of Beech Trees which provide stunning colour throughout the year, from vivid green in the spring to rich reds in the autumn. Share with us your favourite walks to put in future blogs using #WalkNI on social media.